Bit difficult to gauge as the coal was supplied loose at GDSF. However, we only burnt a bunker full each evening when generating, so probably more economical. Size is less of an issue of course, but I generally go for big lumps. That does sound like it is. I think I shall be ordering myself a lump of steel. Might cheat a little and see if I can find someone to set it up on one of those new fangled CNC things to drill the holes, although I suppose if I did some every evening it wouldnt take too long. I was going to say can you give us a close up picture of how much of a bow has happened. The amount of sag is about 6mm at the middle of the length: about the same as the conventional bars in use. Been thinking a bit more about this and wondered if a stainless plate might be worth the investment ? Only if someone else drills the holes! If you did another, as the holes are all aligned, do you think there would be any mileage in welding a few webs along the back. I am considering this as I am still in the build process, and I can get the initial holes knocked through on a water jet cutter. There might be a case for webs Mark, but it is already quite heavy. It may stay with that slight sag. I have a few runs lined up over September, so will keep an eye on it. This modification will make life so much easier and cleaner for oiling up. I will probably do a similar exercise on the nearside hind wheel oiler, but this one is less of a problem for access. If you are making a new engine, I would strongly recommend a similar type of modification BEFORE you get all the other stuff on your engine. i‘d like to follow your recommendation and alter the oiling accordingly. 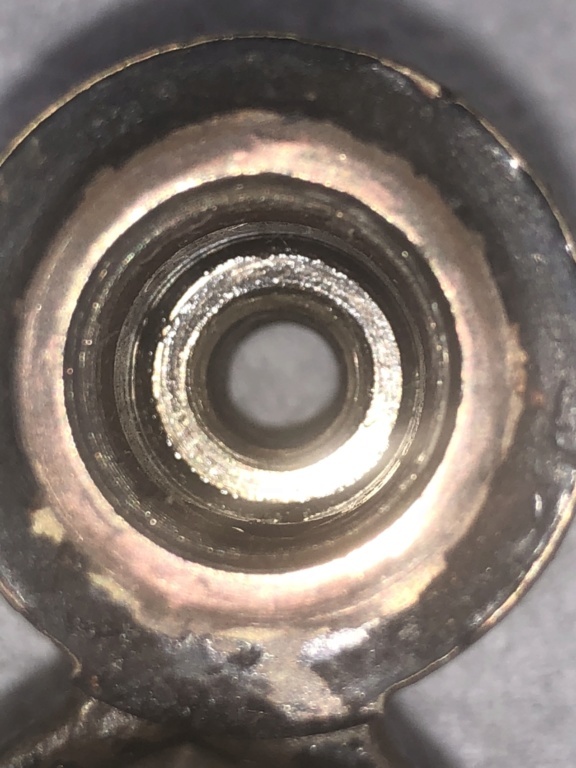 Where did you get the T-fitting, been trying to find such a small one, but the ones I‘ve found seemed to be much larger. I am thinking of doing mine and the 2nd shaft this winter. 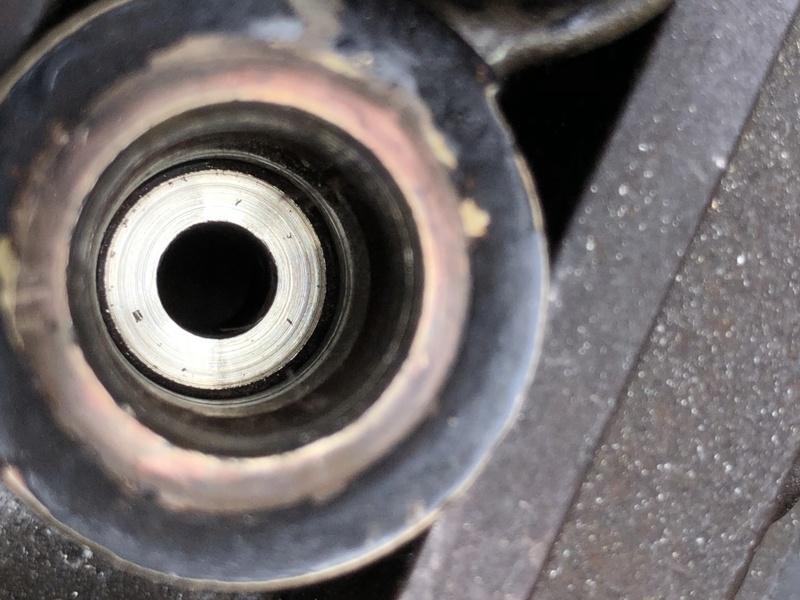 With the high mileage that Frederick has done on the road and at some speed I was pleased to see that the mesh on the drive gears has shown up a perfect long oval in the middle of the teeth. Credit to the design and the machining of the gears for this to be so. I don’t think there is any reason for the Tee piece, other than it being in the bits box. A right angle joiner should suffice: one end is blocked off. 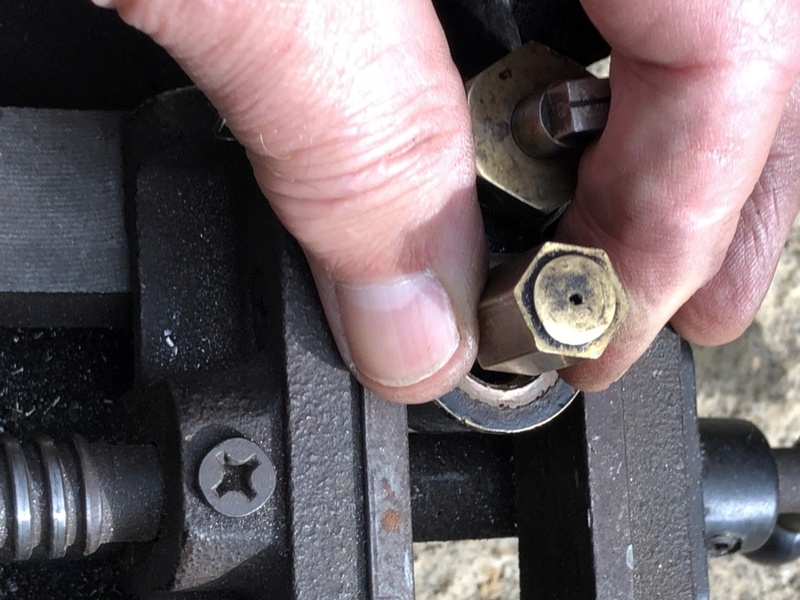 Yes, of course, for the function an elbow would be sufficient, I was only thinking about the T as I liked the idea to be able to check if oil is coming down just to the top of the axle box. Struggling with the gears on the crankshaft and hoping that this time the paint on the tender does come out better - three time is the charm ? 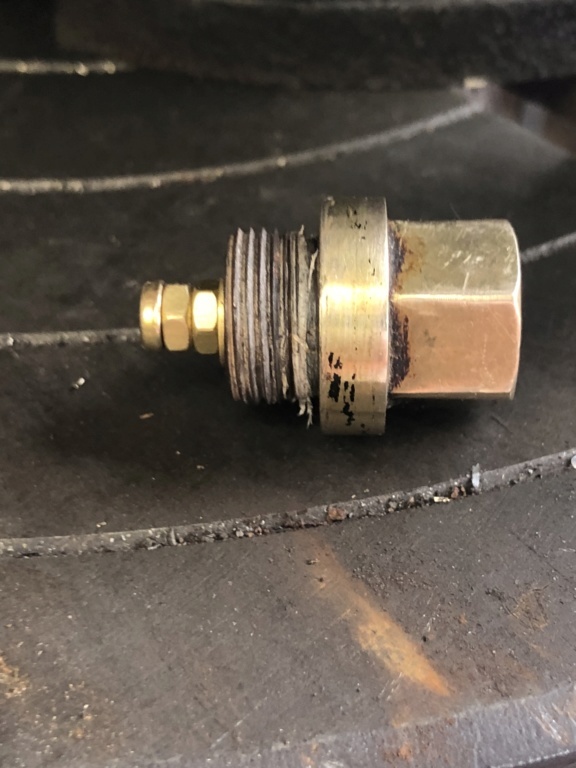 During our recent epic road run the injector worked very well (probably because it was receiving a constant flow of cold water) but has subsequently become less reliable, clearly due to blow-back from the boiler clack. It was dribbling and letting steam by, which was stopped by turning off the clack. On examination of the clack at Old Warden rally, and today, it was evident that the ball had dished out the seating too much: as can be seen in the photo, which shows a little bit of the seating cleaned up (bright ring) to show the inner bevelled opening. I am fortunate to have a stepped mill that is an exact sliding fit for the pipe opening. 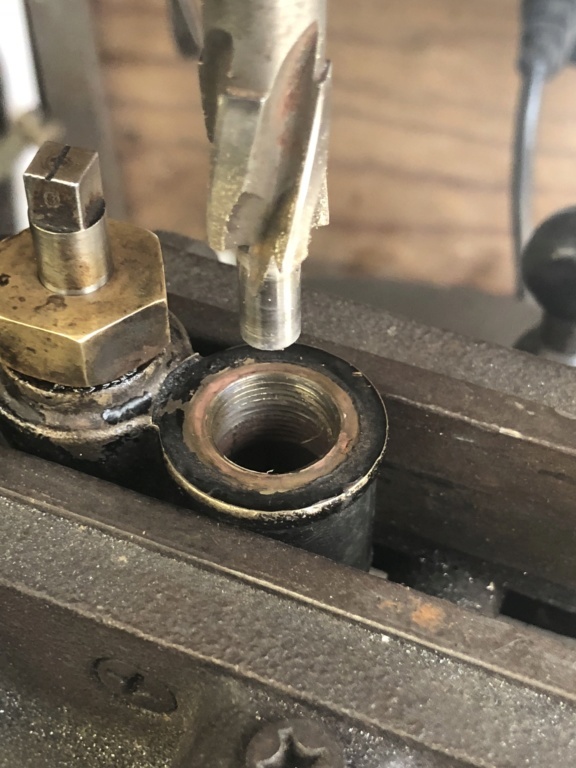 It has a morse taper and so runs true in the drill press and self centres down the feed pipe bore, with the clack casting secured in a machine vice. This was then used to tidy up the seating, by removing 0.6mm and the ball just tapped into it using a brass drift and hammer. 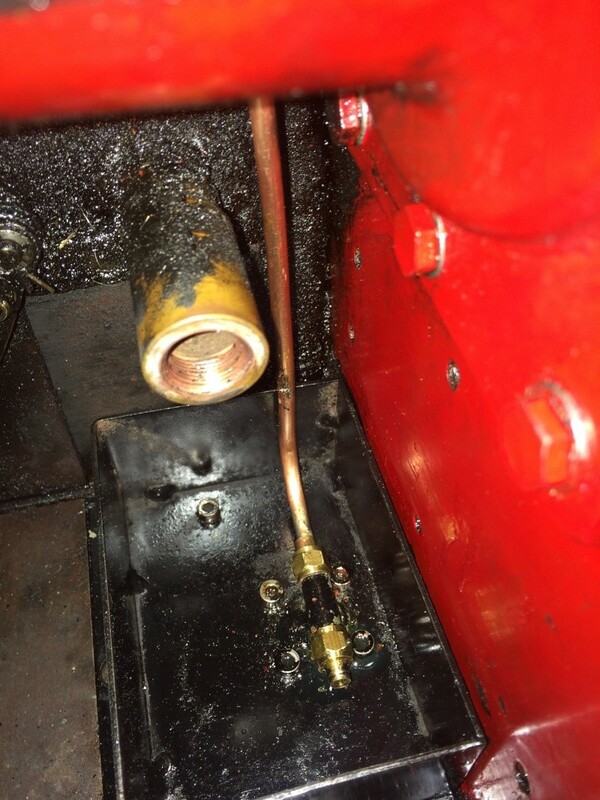 The clack top cap had a new limiter bolt fitted. The vertical clearance for the ball should be 1/3rd it’s diameter. Won’t know if it’s been successful now until next season, as Frederick is drained down for the winter: it should be substantially better. Thank you to everyone who has donated to our Parkinson’s UK Justgiving Page.